A member of WestEd’s Learning Innovations program, Senior Research Associate Jaclyn Tejwani provides policymakers and practitioners with the information they need to improve education services. 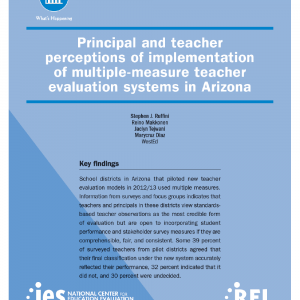 Tejwani’s work has encompassed a variety of evaluation designs as well as content areas, including teacher and principal evaluation, teacher preparation, dropout prevention, STEM, early literacy, and the arts. Her responsibilities include project management and coordination, research study design, instrument development, data collection and analysis, and proposal and report writing. 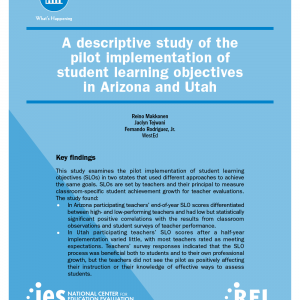 Tejwani serves as Project Director for the evaluation of California State University, Bakersfield’s Teacher Quality Partnership grant project, the Kern Rural Teacher Residency. Tejwani also works on studies of the New Generation for Educators Initiative for the Bechtel Foundation, the Comprehensive School Safety Initiative with Miami-Dade County Public Schools, and charter and magnet school program monitoring for the U.S. Department of Education. 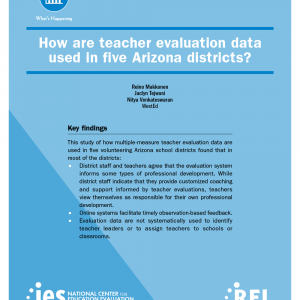 How Are Teacher Evaluation Data Used in Five Arizona Districts?